The Channel Islands’ longest running music festival, the Vale Earth Fair, will this year be headlined by Punk legends Buzzcocks. “It will be an event not to be missed,” said Vale Earth Fair Collective member Rob Roussel. 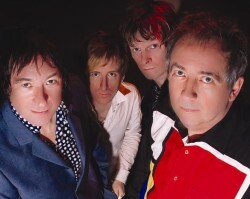 Buzzcocks’ classic songs include ‘What Do I Get?’ the anthemic ‘Harmony In My Head’ and, of course, the song that has become their calling card: ‘Ever Fallen In Love With Someone (You Shouldn’t’ve Fallen In Love With?)’. Other acts already confirmed for the Vale Earth Fair include folk legend Vin Garbutt, winner of BBC Radio 2 Folk Awards “Best Live Act” Award in 2001. Profits from the Vale Earth Fair are split between Burma Campaign UK, Free Tibet, and Bridge2Haiti. If you want to learn more the Vale Earth Fair, visit: http://www.valeearthfair.org. Advance tickets are already on sale though the Vale Earth Fair website http://www.valeearthfair.org for £15 or you can pay £20 at the gate on the day. Children (12 and under) are free if accompanied by an adult.